Just 2 Cans A Day Of Monster Energy Drink Can Kill. Avoid At All Cost! These days teenagers are targeted by energy drink companies as a replacement for alcohol, to trick them into thinking they are consuming “adult” drinks. These drinks are filled with higher than legal-set levels, of toxic chemicals that is detrimental to body health. Energy drinks are next to multivitamins in popularity amongst American teenagers and young adults. Research into this had found that men between 18-34 had consumed the most energy drinks, and a third of teenagers between 12-17 consume them daily in excess. In the years from 2007-2011, energy drink-related emergency room visits increased, and people over 40 experienced the highest increase. A dangerous trend has grown amongst teenagers drinking energy drinks with alcohol. College students were found to do this as well. In fact, 25 percent of students in college consumed the dangerous mix, and binge-drink frequently than students who don’t mix alcohol with energy drinks. 42 percent of energy drink related emergency room visits had a combination of drugs or alcohol (involving Adderall, marijuana and Ritalin). Over 5,000 cases were reported to poison control, in 2014, after becoming sick from consuming energy drinks. The American Heart Association reported that the cases were labeled as “accidental ingestions”, that involved severe side effects such as, high blood pressure, irregular heart rhythm or seizures. Robert Grim, a resident of Arizona, was traveling to work one morning in December 2014, until he started to feel nauseous. He immediately pulled over and called his employer to call out of work. When he arrived at home, his symptoms started to gradually worsen. He went to the ER and found out that he had stage 4 kidney disease. In the lawsuit filed against Monster Energy, Grim claimed that he drank a can of monster energy that day, as he usually would every day for a decade. Before he was given the shocking diagnosis, Grim was chugging 4 monster’s a day (equal to eighteen 12 oz cans of Coca-Cola). From his excessive consumption of Monster energy drinks, he is now waiting for a kidney transplant, while undergoing dialysis. In 2013, Paula Morris, from California, sued Monster when her 19 year old son, Alex, died from cardiac arrhythmia. She alleged in the case, that Alex drank two cans of the energy drink daily for three years, and on the day he passed away. In 2012, a resident from Maryland, 14-year old Anais Fournier died from cardiac arrest due to the excessive amounts of caffeine inside the energy drink. That’s what her family argues, is the cause of her death. 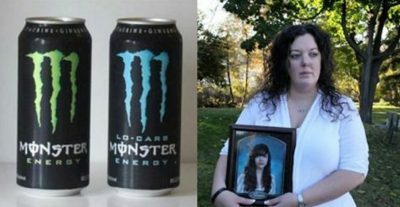 They claim, the girl had a heart condition, and after consuming two 24oz cans of monster energy drink, went into cardiac arrest within 24 hours of ingestion. Her autopsy discovered that she had a high level of caffeine toxicity in her blood that hindered the heart’s ability to pump blood, CBS reports. 14-year old John Staten, of West Virginia, drank a can of monster while getting warmed up for football and wrestling practice. The lawsuit stated that one day in February 2012, John fell to the ground due to his left side being numb and he even had trouble speaking complete sentences. When John went to the ER, doctors overlooked his symptoms and condition, and said it was a pinched nerve because of his age. A few days later, John underwent an MRI where his pediatrician discovered that he had a stroke, according to court documents. The boy consumed 3 24oz cans of Monster in the duration of three months, which equals up to 21 12oz cans of Coca-Cola. If you do your research, you will find lots of lawsuits against Monster! The reason these energy drinks are so favored by kids, is due to the energy boost and high sugar content. These products appeal to young consumers because they aren’t old enough to consume alcohol, and they aren’t well-educated about nutrition and the dangers of frequently consuming energy drinks. It is becoming common that minors under the age of 18, are suffering from harsh side effects from energy drink consumption. These energy drinks, even though they deliver a boost in energy and alertness, they are dangerously unfit for daily consumption. Monster’s primary ingredient is glucose (sugar), as a 12oz can is filled with 38 grams of sugar. If you consume an excessive amount of sugar, which is in energy drinks and sodas in toxic levels, you will suffer serious side effects. When consumed in moderation, glucose can act as a fuel for cellular function in the body. When your body is jammed up, glucose can work as a deteriorating agent that works to destroy the cells ability to produce insulin. The pancreas suffers extensive damage when it has to make up for the high levels of insulin. Glucose, in excessive amounts, can lead to the hardening of your blood vessels (Atherosclerosis). Stress even can cause lots of damage to blood vessels and organs. Damage occurs quickly once mixed with other toxins in our bodies, due to a diet in high-fat and processed foods. 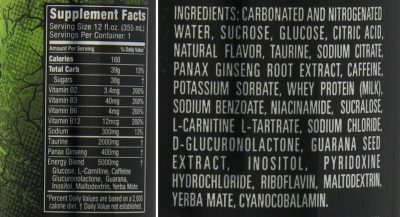 Caffeine and Guarana Seed Extract are artificial stimulants. Energy drinks like Monster have very high levels of artificial stimulants. One 12oz can of Monster has 120mg of caffeine, which equals to 600% more caffeine than a can of Pepsi or Coke. Drinking this toxic combination can be very deadly for a teenager. Drinking one can of Monster alone can surpass the body recommended daily value for sugar. It can lead to anxiety, extreme irritability that may turn into violent behavior, insomnia, dizziness, nausea, headaches, tremors, and abdominal pain. Adults that have consume high levels of artificial stimulants can lead to increased urination causing dehydration, stroke, death, high blood pressure, heart palpitations, gastrointestinal disturbance, dizziness, irritability, nervousness, headache and severe fatigue from withdrawal, and allergic reactions. Monster energy drinks have 400mg of this toxin of a stimulant, in a 12oz can. When mixed with stimulants like caffeine, and artificial ingredients, they cause a variety of severe side effects like: kidney failure, high (or low) blood pressure, increased heart rate, asthma, breast pain, loss of appetite, headache, mood changes, insomnia, nose bleeds, excessive menstruation, and fatigue. It is recommended by the Food and Nutrition Board, that on average we are supposed to consume 14-18mg daily for adults, with a higher intake level of 35 mg for therapeutic use. A 12oz can of Monster energy drink provides 40 mg, which converts to 200% of the daily required amount of (synthetic) vitamin B3. If you consume whole foods that are abundant in vitamin B3 (niacin), you wouldn’t experience any severe side effects. There is a reason why niacin is rarely found in natural food—it’s because our bodies don’t need so much of it. But, when taken in supplement or synthetic form in high doses, side effects can be harmful. Niacin is utilized as a natural blood thinner and only a very small amount is needed to improve blood circulation. Within half an hour of taking niacin, one may experience a “niacin flush” when the capillaries become dilated and increases blood flow, causing a warming sensation and reddening of the skin. When taken on an empty stomach, the effect can be felt instantly. This overdose amount of niacin used as one of the ingredients in an energy drink—that gives a sudden surge of energy—will also carry with it, all the artificial stimulants and synthetic ingredients to be distributed throughout the body. It may give the drinker a temporary “high” feeling, but also bring extreme harm to all the organs in the body. Potassium sorbate is a chemical food preservative that is toxic to the human peripheral blood lymphocytes (white blood cells). Mainly, it damages the genetic information within a cell, causing mutations that can cause cancer to form. Sodium benzoate is a synthetic chemical produced by combining sodium hydroxide and benzoic acid. A lab study looked into the impact of sodium benzoate on cultured human cells. It was found that the chemical triggered an increase in damage to DNA and initiated cell mutation leading to cancer. The effect is made worse when added to foods and to the interior of metal cans that contain beverages or liquid foods, due to the interaction with the metal.